Dimensions of Original: Unframed size: 52”x 34” Size as currently framed: 63’’ x 45” (approx.) Description of current frame: moulding is 2-level black satin finish, approx. 3” wide, capped w/ angled dk mahogany moulding, approx. 3.5” wide- overall weight is approx. 25 lbs. 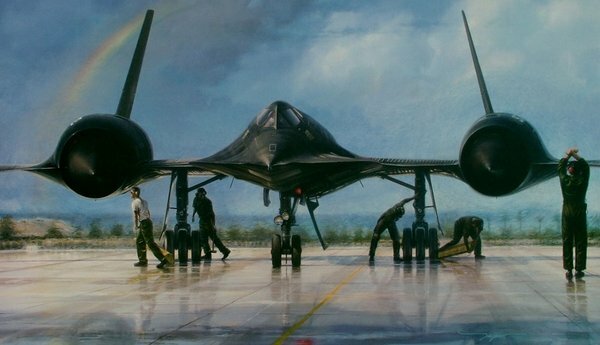 Miscellaneous Information: Subject (as described in litho caption/sales literature): Outrun the Thunder: A Tribute to the Legendary Lockheed SR-71 Blackbird Last minute engine run-up and checks are performed on Habu 972 at Det 1, Kadena Airbase in Okinawa, Japan, prior to an operational reconnaissance sortie over the USSR’s naval port at Vladivostok. For over 21 years, Lockheed’s famed SR-71 Blackbird flew highly-classified missions all over the globe, gaining fame as the world’s fastest and highest flying aircraft. Dimensions of Original: Unframed size: 52”x 34” Size as currently framed: 63’’ x 45” (approx.) Description of current frame: moulding is 2-level black satin finish, approx. 3” wide, capped w/ angled dk mahogany moulding, approx. 3.5” wide- overall weight is approx. 25 lbs.